I haven’t posted about beauty or fashion before, but this month I found too many great new products not to share! These are some cute and functional pieces that I got from Christmas, my birthday, or awesome after-holiday sales. I’ve had my eye on this wallet for a while, as small wallets like this one are a must in college, to keep your keys, ID, and cards handy on-the-go. Kate Spade never disappoints! I especially love that it has a key ring attached, but I always prefer a zipper closure over a snap. I’m working on growing my makeup collection, but I’m all about finding quality makeup for less than the ‘designer’ brands, so NYX is a great choice. These lipsticks are affordable, come in lots of shades, and won’t dry out your lips. Its one flaw is that it’s not as long-lasting as other matte lipsticks, but it’s still an easy favorite for me. This is my new go-to for every day wear. It’s hydrating and comes in lots of colors. I’ll definitely be adding more of these to my collection soon. Best Features: Keeps your drink ice cold all day! These type of water bottles are perfect for staying hydrated at class or at the gym. The ‘off brand’ versions work just as well, and they really do keep your drink cold! I have these in 4 different colors, they’re that great (and AE’s winter sales were that great). All the shirts in this line are soft, comfortable, and can be styled lots of different ways. Another perk, they were designed to be long enough to wear with leggings, so I’ve been wearing these with booties every chance I get. My sister and I both each got a pair of these on our most recent trip to TJ Maxx, and we got them for half the advertised price on Dr. Scholl’s! We’ve both been looking for a pair of sandals like these, and the price, style, and comfort made them a no-brainer. They aren’t as all-day comfortable as I was hoping, but they’re still comfier than regular sandals. Like the Kate Spade mini-wallet, this is a great item for any college girl. It fits the necessities without being bulky. 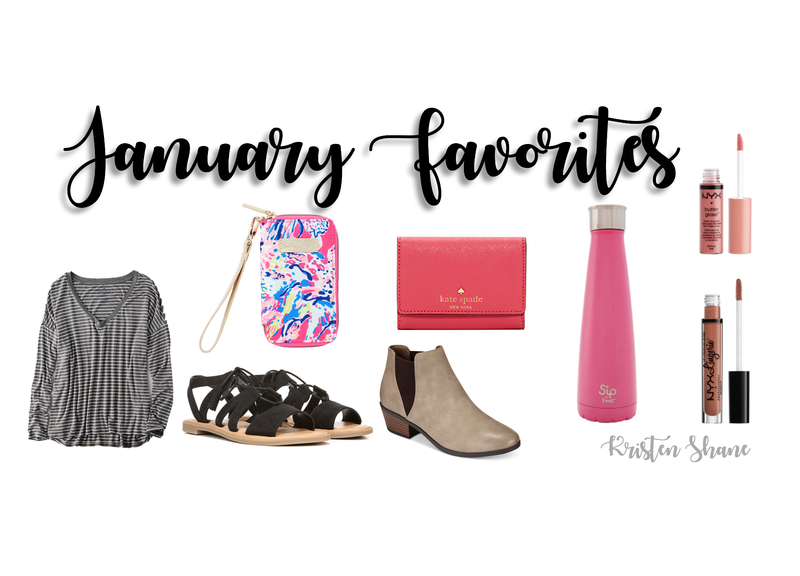 I hope you enjoyed my January favorites, I’m so happy with these products and I know they will all be favorites of mine for a long time.